Do you Play Take5 Free Slots? Join GameHunters.Club our members share free bonus, tips, guides & valid cheats or tricks if found working. Check out the Take5 Free Slots Bonus page to see the full list. If you need to add friends for gifting or exchanging game-items you can check or join the Take5 Free Slots Add Me List. GameHunters.Club is a Fan Site and is not endorsed by or affiliated with Take5 Free Slots. All Trademarks are the property of respective owners. If you love this game, support it by purchasing premium items in the game or follow the official Take5 Free Slots social media channels. GameHunters.Club is a platform for gamers who loves to share. Join us and be the first to post here about Take5 Free Slots. There is no registration required. Login with Facebook to start posting. Join the Forum, Discuss anything about Take5 Free Slots. You can talk about tips, tricks, cheats, ask for help or simply introduce yourself to the club. These are the most recent topics and posts on Take5 Free Slots Forum. Do you know any of this topics? Help players by posting about this topics on Take5 Free Slots Game Post section. Try out our new Hocus Pocus Challenge! Incredible rewards await you! http://t5.w-ga.me/FcApri21xbex ◀ Claim Your FREE COINS and SPIN with us! Click LIKE & SHARE to inspire your friends as well! Robert. http://t5.w-ga.me/FcApri21bb ◀ Claim your FREE COINS on your mobile & PLAY NOW! Haven't played on our Mobile App yet? Click the links below, install Take5 App! iOS: https://bit.ly/Take5_iOS Android: https://bit.ly/Take5_Android Amazon: https://bit.ly/Take5_Amazon... Click LIKE & SHARE so your friends enjoy FREE COINS & our Mobile App! Robert. http://t5.w-ga.me/FsApri21be ◀ Claim your FREE SPINS on Tiki Twilight! Click LIKE & SHARE to let your friends enjoy spinning too! Robert. COMMENT with your answer! I'll pick "5" random comments with the right answer and award "10,000,000" Coins prize! After Commenting, http://t5.w-ga.me/PlayTake5Slots ◀ Check it out & PLAY NOW! Click LIKE & SHARE if you know the answer! Robert. http://t5.w-ga.me/GeApri20Wx ◀ Crack open your Free Golden Egg Bonus! The Golden Eggs hold sweet Bonus Coins. Click LIKE & SHARE so your friends can get cracking too! Robert. "LIKE" this post for "100" Free Spin bonus or "Share" this post for Extra Lucky Wheel! Of course, you could do both! I will post a bonus link for the bonus getting more votes! After voting, http://t5.w-ga.me/FcApri20xu ◀ Claim Your FREE COINS & PLAY NOW! 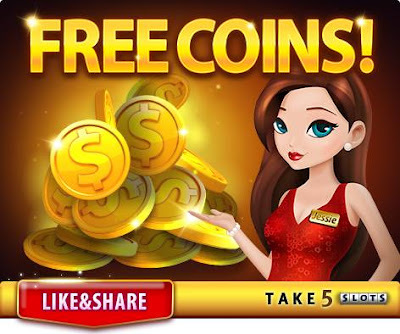 Click LIKE & SHARE to let your friends enjoy the FREE COINS too! Robert. Try out our new Hocus Pocus Challenge! Incredible rewards await you! http://t5.w-ga.me/FcApri020Vb ◀ Claim Your FREE COINS and SPIN with us! Click LIKE & SHARE to inspire your friends as well! Robert. Play Free, Become a Superstar! Enjoy a whole new casino experience like no other!